It contains handmade beaded trimming, handmade flowers, crochet patterns by hand, beaded lace, beaded necklace and appliques. All could be decorated on your shirts, wedding dresses to have a special and unique luxury result. 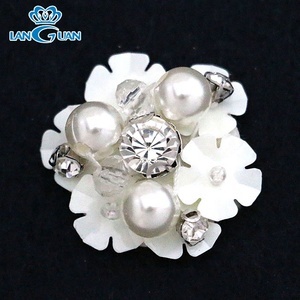 sequin beaded flower handmade 1. within 12 hours oversea response save your time. 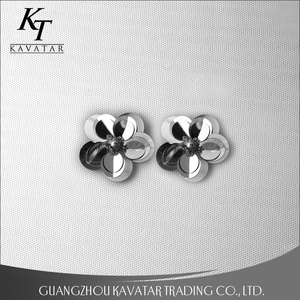 5 YRS Guangzhou Kavatar Trading Co., Ltd.
1 YRS Yiwu Lanying Garment Accessories Co., Ltd.
2. After-sales service We aim to give you the best after-sales service. For example, we customize your products with your logo for you. 4. Provide samples We provide you free samples for reference. 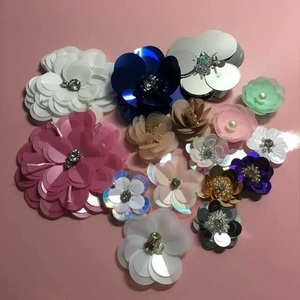 3 YRS Dalian Yima Garment Accessories Co., Ltd.
Patch Description China wholesale custom made large sequin beads flower for clothing . 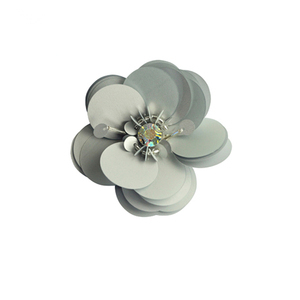 We are glad to learn your idea and requirements, any kinds of sequin beads flower. quantity and material, make sure not to be damaged, and reduce the cost of freight. if you are not a wolesaler, just need a small order, do not worry, we also welcome small orders. we have grown to be afamous manufacturer and wholesaler in china. Yardage:5-20yds per piece,1 piece/rolled without paper card;Around 10pc/opp;5-20opp/carton box;Carton measure:50*40*40cm. 2 . Neck piece:around 10pcs/opp;3-50 opp per carton;Carton measure:40*30*30cm. 3 . Rhinestone brooches:5-10pcs/tissue paper;20-40pcs/inner box;4 inner/carton;Carton measure:30*20*20cm. it is very vivid and cute and blingbling b outique for garment accessorie which is hot sale in us and europe. it is made with sequin, beads claw crystal ab rhinesrones and emerald claw crystal stones and white felt. you can also sewing instead of ironing. or you can sew it on clothing. 1 YRS Shenzhen Lannister Trading Co., Ltd. Welcome to Guangzhou Hechun Texitle Co., Ltd. 4. Ensure the products meet the quality standards. 5. Ensure the goods will be delivered on time. so we can not show them to others without our clients' permission. if the product does not meet your strict requirements, we can provide either immediate refund or immediate remakes at no extra cost to you. backing heat applied, pellon backing, hook and loop backing,etc. 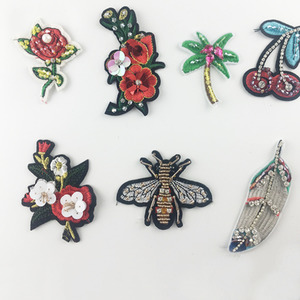 wholesale flat flower sew on embroidery patch flower embroidery patch product name wholesale flat flower sew on embroidery patch material polyester,cotton,leather,felt,etc. 2.How can we place sample order9 If sample without logo,we can offer you free sample. If sample with logo,please contact with us,we will quote you sample price and freight. 4.What in packing term9 Sample delivery time is 4-6 days,mass production time is less than 15 days. 4 YRS Guangzhou Holdbeauty Garment Accessories Co., Ltd. Custom designs plastic sequin handmade sew flowerss Name Custom designs plastic sequin handmade sew flowers Unit price 0.1-0.8USD/pc Delivery time 10-15 days after order confirmed MOQ 100pcs/color Payment term T/T , Western union, Paypal,L/C Color Customized Material: fabric+sequin Supply ability 50,000pc/pcs per month If you need the color card,please send me an email. More deisgins Terms of payment: PayPal, Western Union, Money Gram, Bank Transfer (T/T) 30% of the advance payment,settlement of all of the mantissa before shipment. Order process Packaging & Shipping 1.Packaging:Inner packing: Poly bag, Outer packing: Standard export carton,can be changed according to customer request 2.Delivery time:Within10-15days after sample &order approval. But Some samples are charged and you need to pay the courier fee. Our advance 1. We specializing in garment accessory industry more than 10 years , we can provide the goods with best quality and best price. 4. Ensure the products meet the quality standards. 7 YRS Shenzhen Phoenix Flame Fashion Co., Ltd.
1. What's Your Samples Policy9 Answer: Usually we offer free available samples, for customized sampling, we take little sampling charge. 2. Can I Get a Cheaper Price9 Answer: Price here is just for reference. 3. What if I don't find what I want here9 Answer: We have quite lots of products. New design handmade flower trim embroidered sequin lace applique FHA-041 PRODUCT DESCRIPTION Product Name Handmade applique trims Model No. Color C an be customized according to your needs Size Same as sample/Can be customized Customized Accepted Moq 10pcs Usage Wedding dress/Gowns/Heads/bags ect. PLEASE GIVE ME A CHANCE & SEND ME INQUIRY OR CONTACT WITH ME for New design handmade flower trim embroidered sequin lace applique FHA-041 AS BELOW: LET'S DO A NEW & MOST SUITABLE DESIGN FOR YOU ONLY ! 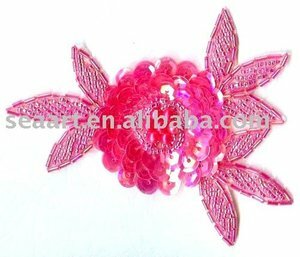 Alibaba.com offers 24,962 sequin bead flower products. About 18% of these are lace, 12% are patches, and 4% are decorative flowers & wreaths. 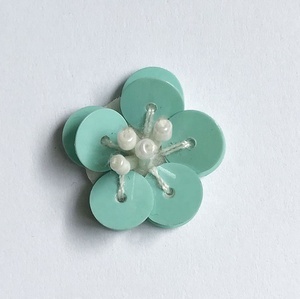 A wide variety of sequin bead flower options are available to you, such as embroidered, beaded, and appliqued. You can also choose from 3d, eco-friendly. As well as from free samples, paid samples. 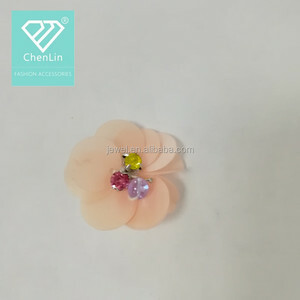 There are 24,962 sequin bead flower suppliers, mainly located in Asia. 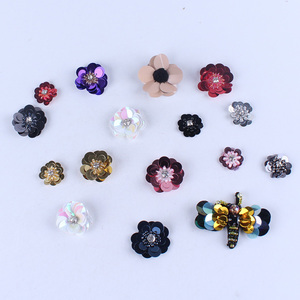 The top supplying country is China (Mainland), which supply 100% of sequin bead flower respectively. 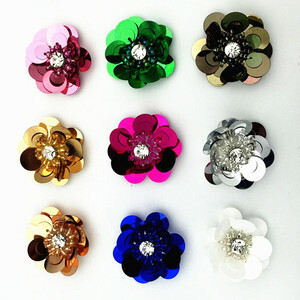 Sequin bead flower products are most popular in North America, South America, and Central America. You can ensure product safety by selecting from certified suppliers, including 772 with Other, 263 with BSCI, and 258 with ISO9001 certification.